When was the last time you took a break? This could be a short-time away, an annual holiday or just a break away from your computer screen. In today’s fast-paced world we are all driven to work more and play less. This is not a good scenario. You’ll remember the old saying “All work and no play makes Jack (or Jill) a dull boy (girl)” and this is true. However, it will not only make you “dull” and lacking in energy but potentially unwell. So in my opinion, breaks from work are actually vital to your overall health and well-being. I know from personal experience that forcing myself to stay working in front of my laptop when I am tired, that I am less productive and unable to really focus on what I am doing. However, if I take a break from the work and do something else, then come back to it then I am able to look at the work with fresh eyes and a clearer mind. I also find that I am able to focus much better. So, how often do you take a break? Work is important, particularly when so many people are now unemployed as a result of the downturn in the financial markets. However, nothing, and I repeat – NOTHING – is more important than your health. How much time do you think you “lose” everyday to non-essential tasks or activities? It is estimated that we can “lose” (or not use effectively) up to 2 hours a day through non-essential activities. Some of the above can be taken care of by you being more forthright about your time and being more protective of it – after all it belongs to you (doesn’t it). However, sometimes you might find yourself in situations that are difficult to get out of without appearing rude or insensitive. So what do you do? – You use your “diary or schedule” as your legitimate way of closing meetings on time, being where you need to be on time and gaining back control of your day. However, if you don’t use a diary or the one you have you don’t use well or is ineffective, then you need to take some action to rectify this. Which diary system should I use? This is really useful if you travel around a lot between meetings (e.g. seeing clients) and don’t want the fuss of maintaining an electronic gadget. These are useful, they are portable, come in lots of sizes and look business-like. However, you do have to remember to take them with you and keep it updated. This is like a FiloFax on speed – it is really effective not only at scheduling appointments but planning your week and working out which days you will do each task. It is very portable but with all things you do need to keep it up to date. These are useful as long as you keep it up to date at all times. You also need to remember to either upload the data onto your computer or ensure that it is fully charged at all times (otherwise you may lose your data). For example Microsoft Outlook which you can use on your desktop. This works well as long as you have constant access to your computer. You can access it remotely as long as your email is accessible remotely. The downside is that it is not portable. These are good again, as long as you have access to a computer. The good thing about these is that they are accessible world-wide – as long as you have access to a computer. Again these are not very portable. How portable does your system need to be? The bottom line with all of these systems is that in order for them to be effective you have to keep them fully up to date – at all times. I have just started using a Planner Pad and found this to be very helpful at keeping me on track and accountable which is useful when you are working for your self (www.plannerpad.com). However you need to use a system that will work for you. Once you have settled on your system you then need to have some diary management techniques that you can use to gain back some time. Schedule meetings with yourself – particularly if you need to get a task completed by a specific deadline. This is helpful with online diary systems that others can access as they will be able to see you are busy. Plan your week in advance. This will save you having to think about what you are doing each day as you will have already mapped it out. I would suggest you do this as your last task on a Friday and then you can start the following week fully prepared to hit the ground running. Once you get into a habit of using your diary system more effectively you will wonder how you ever managed without it. It is almost as though we have written-off today and that tomorrow will always be better. Now I am not saying that tomorrow won’t be better or that thinking positively is a bad thing, but if we just took time to appreciate what we have today then tomorrow will take care of itself. I suspect some of you may have been wondering where I have been for the past few weeks? Essentially The Calm Coach will be your one-stop shop for reducing overwhelm, stress and chaos from your life and bringing back that sense of calm and a greater level of control. I don’t have any space to call my own – how do I create my own oasis of calm? These are just a few examples but essentially I am here to help you work through anything that is causing you chaos or overwhelm. 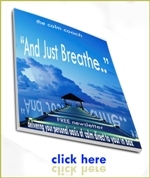 The address for my new website is www.thecalmcoach.com – however, if you still have The Breathing Space URL in your favourites then this will automatically redirect you to the new site. Also, my new email address is maureen@thecalmcoach.com but if you send a message to maureen@the-breathing-space.com address I will still receive this as it will be automatically forwarded to me. So hopefully you will still be able to find me no matter which email or website address you have. I would love to hear from you. I will then write back to you individually and also write a blog post about the topic so that others can benefit as well.